Art Div. | NAGAE Ltd.
We are going to take part in Milan Design Week this year. Our items are going to be displayed at Asia Design Pavilion. This is the first project that Milan Design Week dedicates to Asian design. The exhibition and communication platform is designed to enhance and present the multiform Asian creative scene in a unified way and to strengthen the dialogue between East and West. If you would like further information about the shows, please contact us. We are going to take part in the following event this summer. If you plan to visit the show, please drop by at the booth and say hi to us. NAGAE is going to take part in the international interior exhibition in Tokyo this month. We will be in the booth on both 15th and 16th. If you plan to visit the show, please drop by at the booth and say hi to us! We took part in a ceremony that unveiled a bronze elephant statue in Tokyo. A Japanese morning information programme “Machikado Johoshitsu” (NHK) introduced our aluminium Ikebana vase "Sakasa Fuji"this morning. NB: We are afraid this item is currently sold out in our web shop, thanks to your orders. We will inform you when we get them in stock again. This summer we are going to take part in some events. We look forward to meeting/ seeing you at one of our upcoming shows! Our naft products are to be showcased in Suzhou, China. 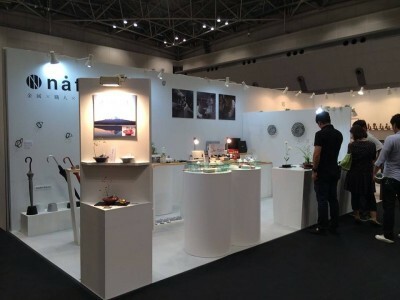 Our naft products are showcased at Taiwan Design Expo until 6th December. We are holding “Made in NAGAE” show at Higashiyama Gallery Edge in Kanazawa. at China International Furniture Fair (CIFF). We would like to announce our participation in the 80th Tokyo International Gift Show (TIGS), which is the largest trade show in Japan. NAGAE Ltd. takes part in this gift show regularly, twice a year. We regard the show as a great opportunity to introduce our newest products and meet our potential business partners as well as see our established partners. If you have a plan to visit the show, stop by our booth (#3048-3051) and say hello. Should you wish to have an individual meeting with us, please contact us and reserve a specific meeting time in advance. We are looking forward to meeing you on site. We would like to inform you that our tin tumbler collection 'SHIKICOLORS' and the others are exhibited at Helsinki Design Week. The show will be held 3rd to 13th September with the theme ‘Time Machine’. Our products are going to be displayed at 'Japanese Design Revisited by Lexus' in L3 Design Dock as well as the other wonderful collections whose root in Japanese aesthetics and handcraft traditions. "Solano S workshop" will be held at the art gallery, HAN BUN KO, on 15th August. As usual, we are going to take part in NY NOW this summer. You can find our products at #3821 as a part of Eastern Accent booth. There are more than 2,500 exhibitors in the show, so please don’t get lost. We will be showing some new products for the first time @ NY NOW. A Japanese morning information and news programme “Asa Chan!” introduced our aluminium massage tool "collinette" this morning. We would like to inform you that our products are exhibited at SALONE DEL GIAPPONE. We would like to inform you that some of our samurai helmets, kabuto, collection are available at the museum shop, ArtScience Museum, Marina Bay Sands, Singapore. We have a pop-up shop at TOKYU HANDS in Gingza from 12th to 31st May. You will find our two items lines; modern home accessories (naft) and traditional products (ginga-do). When you visit Ginza, please drop by our pop-up shop. We are going to join an exhibition featuring “Toyama products” in NY this month (Read on our blog in detail). We are looking forward to knowing what the response will be in NYC. If you have time or happen to visit NYC at that time, feel free to drop by the show. We will be displaying at “CREATIVE EXPO TAIWAN (CET)” from 29th April to 4th May. During the biggest design Expo in Taiwan, there are loads of design-oriented events and activities in and around the main halls. We will be at our booth, H-2F06, on 29th and 30th at Huashan 1914 Creative Park. Should you wish to have an individual meeting with us, please contact us and reserve a specific meeting time in advance. Please stop by and check out our collection! We added four kabuto to our "desktop samurai helmets collection" - the replica kabuto helmets of Naoe Kanetsugu, Takeda Shingen, Tokugawa Ieyasu, and Uesugi Kenshin. “Kagayaki Toyama Ippin Festa (Toyama Gem Festa)” will be held this weekend at Toyama Prefectural Civic Centre which has just refurbished. In Toyama, there are many regional foods and crafts. This event collects such gem of Toyama. Many local products and foods are lined up and waiting for you, including our naft products. Come to the event with empty stomach! For NYNOW and the Tokyo International Gift Show, we have updated our naft catalogue. If you fancy, please check it out. 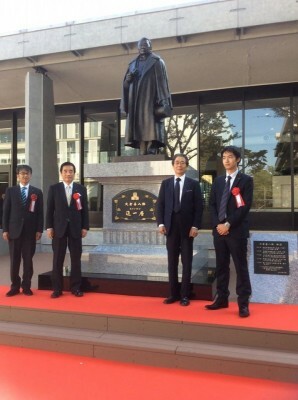 A bronze statue of Prof. Akira Suzuki was unveiled on Friday at Hokkaido University. 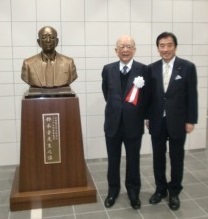 NAGAE Ltd. made a statue of Prof. Akira Suzuki, who awarded the Nobel Prize in Chemistry in 2010, and attended the unveiling ceremony. During the ceremony, we were happy to hear that Emeritus Professor Suzuki and professors of Hokkaido University told the statue was look-like and reflected his personality. We would like to announce our participation in the 79th Tokyo International Gift Show (TIGS), which is the largest International Trade Show in Japan. NAGAE Ltd. takes part in this gift show twice a year. We regard the show as a great opportunity to introduce our newest products and meet our potential business partners as well as see our established partners. If you have a plan to visit the show, stop by our booth and say hello. There a just a few days left until Christmas. With a stunning selection of home decor to choose from, you'll be certain to find the perfect gift for someone special. Shop online before 11:59pm, Friday 19th December! You can get free shipping (only in Japan) and free gift-wrapping, and your order will arrive in time for Chirstmas (Write 'for Christmas' on your order form). NAGAE Ltd. is excited to announce that we are going to exhibit at the NYNOW Winter 2015 as part of Eastern Accent booth again! Please come and visit us to check our latest products. If you won't be able to make it to the show and would like our latest catalogue and line sheet, please contact us. Great News!! collinette, aluminium massager, is featured in the latest issue of anan "What's good for your body" section. Check it out! Our naft products are up for Lohas Shanghai at MORELESS booth. Our latest product 'Aluminium Vase Collection – Shizuka Mt Fuji' went on the market. This is one of our popular 'Aluminium vase collection Shizuka' series. 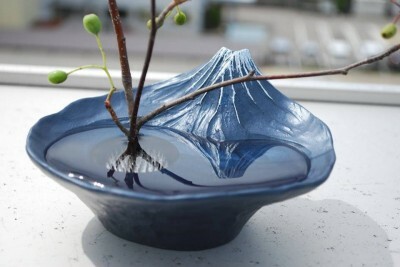 The concept of this product is to create the inverted image of Mt Fuji, which has been admired by Japanese, in your room. Available at our online shop or other shops. This small metallic vase creates a miniature Japanese zen garden in your room. You can place anywhere and don't have to prepare for a bunch of flowers. With a flower or more, you can make a peaceful and quiet atmosphere easily. Putting a small stone or floating flower petals on the vase, you can also enjoy arranging your small garden as you wish. 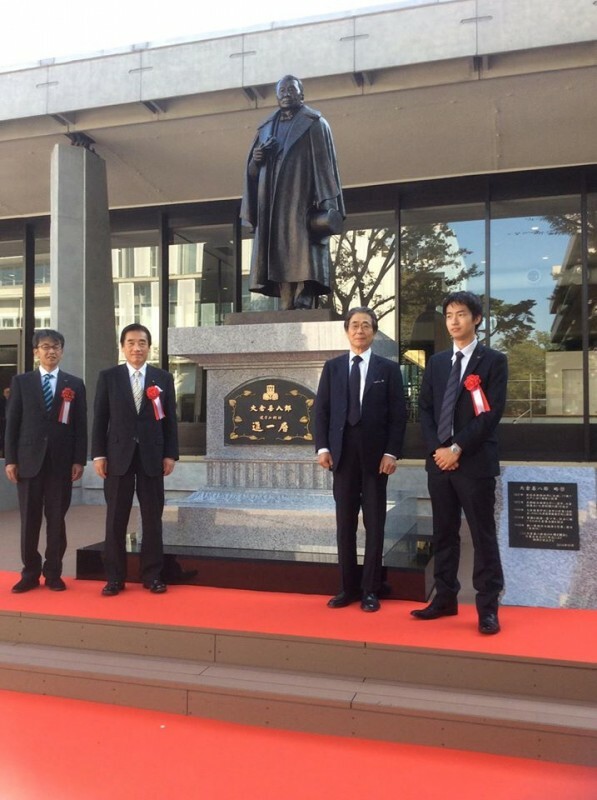 We would like to inform we took part in the event of unveiling a bronze statue at Tokyo Keizai University on 18th October. The statue of Okura Kihachiro, who was a founder of the Okura Commerce School which later became Tokyo Keizai University, is about 4 metre including its base. The university refurbished a library as ‘Forward Hall’. The statue is in front of the hall. It is a great honour to make the statue and help the project. Please feel very welcome to drop around if you are passing by. The Good Design Award 2014 is announcing right now. 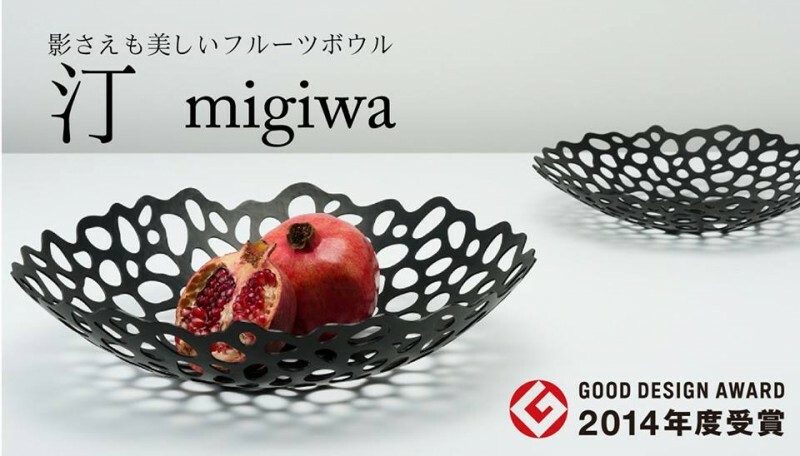 We are happy to inform you our migiwa & amime (Iron all-purpose bowl) won the award! Please see the following in detail.